Your gaming keyboard has keys that let you turn Game Mode on and off, and cycle between five fixed backlighting brightness levels. While Game Mode is on, the Windows, Menu, and FN keys are disabled to prevent unwanted interruptions. To toggle between Windows and Game Mode, press FN and F8 at the same time. The Game Mode LED indicator lights up when the mode is active. In addition to the Windows, Menu, and FN keys, you can disable other keys in Game Mode using Logitech Gaming Software (LGS) 8.98 and later. 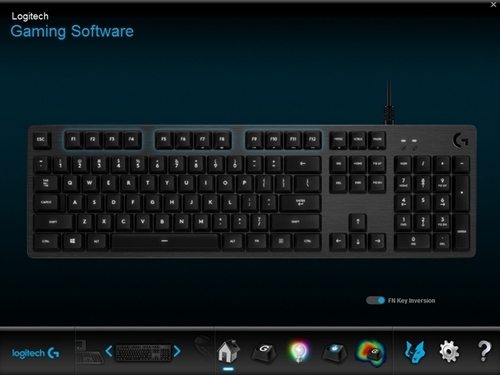 If you don’t have Logitech Gaming Software, you can get the latest version from the LGS download page. 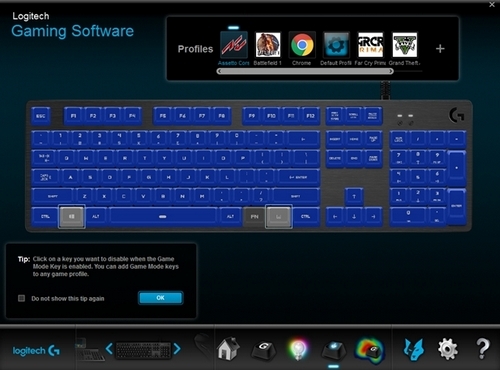 Launch LGS, select your gaming keyboard and click the Game Mode Settings icon. 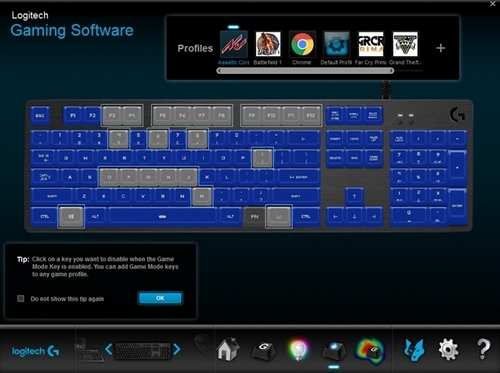 Enabled keys are shown in blue, and disabled keys are gray. To re-enable a disabled key, click on the key again. You can disable keys in Game Mode for any individual profile. NOTE: The Windows, Menu, and FN keys cannot be enabled in Game Mode. To cycle between five preset brightness levels, press FN and F7 at the same time. You can also invert the F keys so you only need to press F7. See FN Key Inversion for more information. NOTE: If keyboard backlighting doesn’t turn on, check the lighting settings in LGS. You can use LGS to invert all the functions that are accessed by default when you use the FN key modifier with individual F keys. This way you don’t need to press FN in combination with the F keys to perform the special functions. Launch Logitech Gaming Software (LGS). NOTE: The image above shows FN Key Inversion enabled.